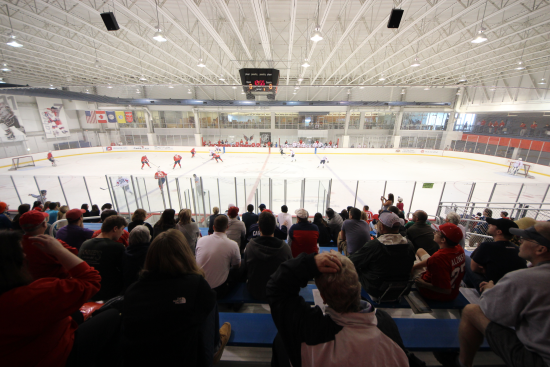 The second scrimmage at Washington Capitals Development Camp took place on Tuesday afternoon at Kettler Iceplex in Arlington, Virginia with new coach Adam Oates looking on. The intensity level during this scrimmage was much higher than Monday's iteration and the crowd was larger and louder as well. Wilson, who lacked speed when competing in the earlier day's speed drills, can get the puck in good position with his strength, but needs to vastly improve his shooting and passing. The other player that fans have been extra excited about is the Caps 11th pick Filip Forsberg out of Sweden. Forsberg clearly needs to add some size to his frame, but he is only 17 years old and was outplaying many of the older guys at camp. On Tuesday in the course of only a few minutes of ice time, Filip missed 2 "lay-ups", one with a completely empty net. Forsberg could have easily had 2 goals and been the highlight of the scrimmage. Andreas Martinsen, a free agent out of Norway, is another big player in the mold of Tom Wilson. His skill is impressive considering his size, and he seems to have a nose for the puck on the offensive end. Martinsen did fall down during suicide drills earlier in the day. One of the quickest and niftiest players that seemed to be able to get off a good number of shots on goal despite his 5'8" size was T.J. Syder. Syder was a free agent that signed with the Bears in March, so fans will get a chance to watch him up in Hershey this season. David Vallorani, a free agent that played 4 seasons at UMASS-Lowell, scored an impressive long range goal and put another great attempt on net later in the scrimmage. Stanislav Galiev looked like one of the most NHL players on the ice in terms of his size and skills, and he should get a chance to put in a lot of minutes in Hershey this season. The Caps resume D-Camp on Wednesday morning, with no scrimmage scheduled for the day.